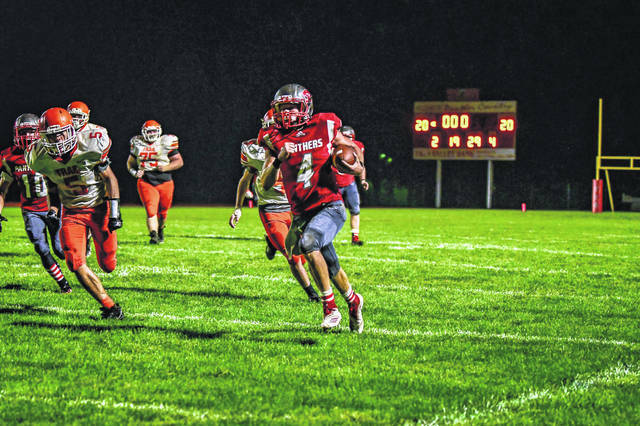 Twin Valley South’s Cade Cottingim races toward the end zone, in overtime, for the game-winning touchdown against visiting National Trail on Friday, Sept. 14. South won 26-20. 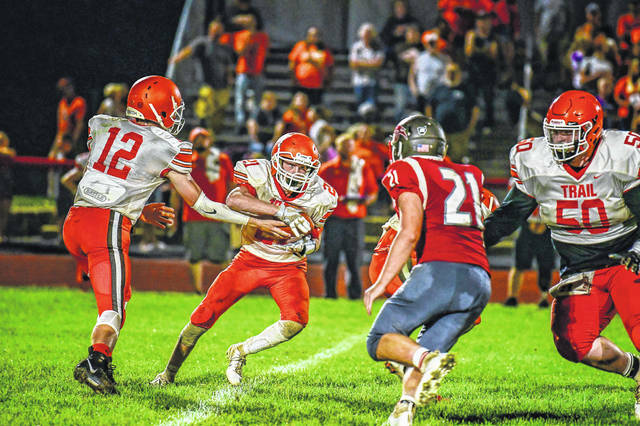 WEST ALEXANDRIA — Cade Cottingim’s 29-yard touchdown run, on a broken play, in overtime, lifted host Twin Valley South to a 26-20 win over visiting National Trail on Friday, Sept. 14. Cottingim was looking for a slant pass, but realized he could get to the outside of the Blazes defense. 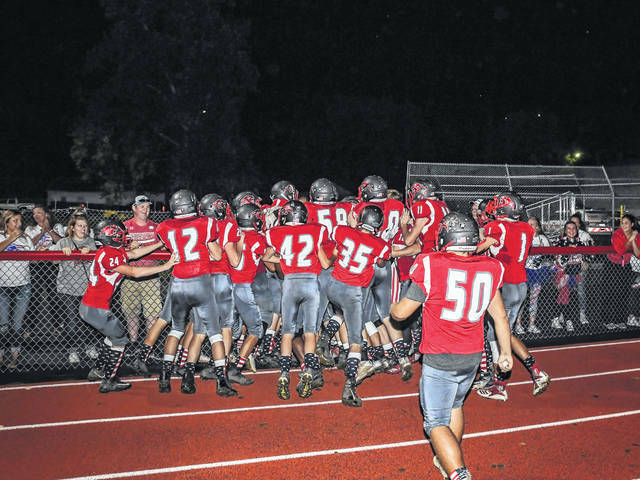 Once he did it was a foot race to the end zone as Cottingim dove for the winning score setting off a wild celebration that extended onto the track as he was mobbed by teammates. Trail got the scoring started taking a 6-0 lead. South followed with a score of it own to tie the game at 6-6. The Blazers regained the lead with 2:20 left in the second quarter, 13-6. 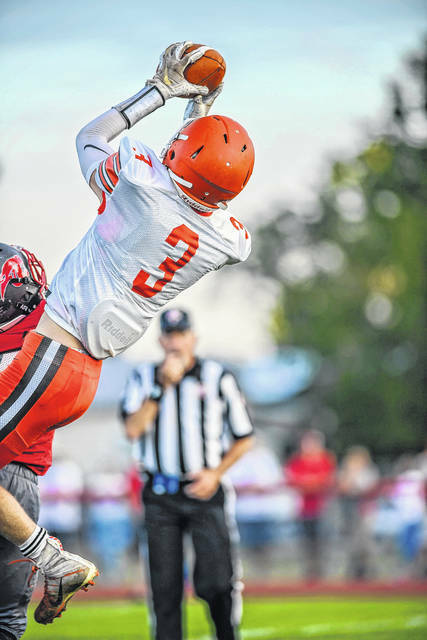 But Cottingim hooked up with Chandler Napier for a 55-yard TD pass to make it 13-12 at the half. Napier was injured on the play and did not return to the game. “Losing somebody like Chandler is a loss. He’s a great kid. He’s a hard worker. 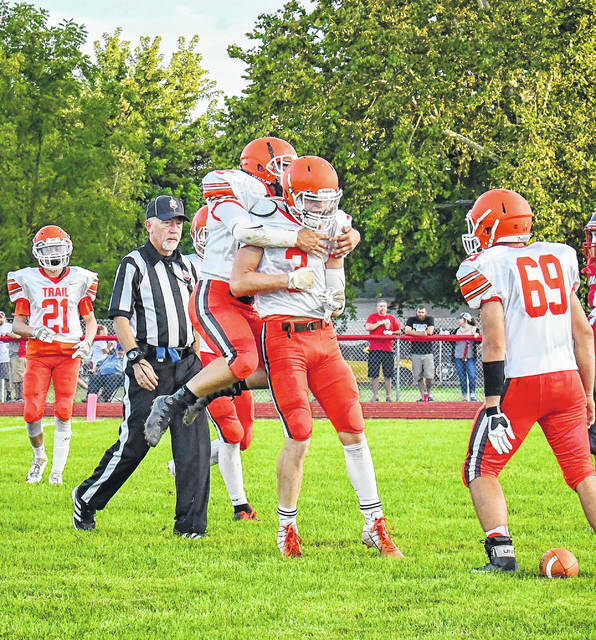 He’s a leader on this football team but we had a couple of young guys just step up,” Bartlett said. NT pushed its lead to 20-12 with with 44 seconds remaining in the third quarter. 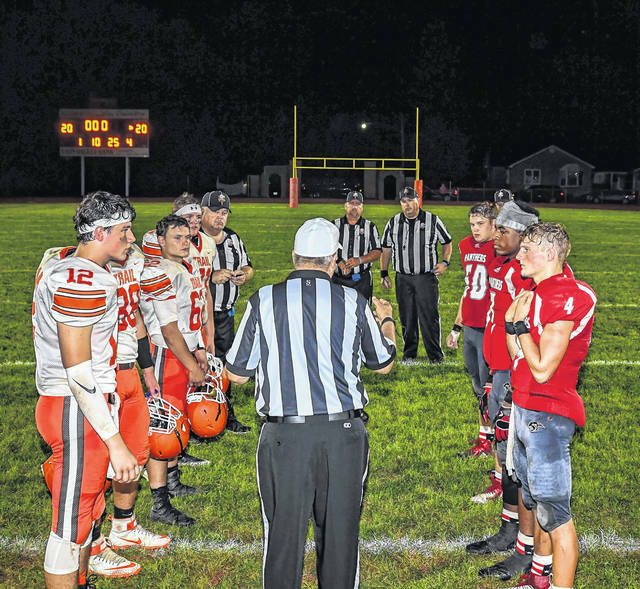 On the ensuing kickoff, Cottingim returned the kick for a touchdown and the two-point conversion tied the game at 20-20 with 31 seconds left in the third. 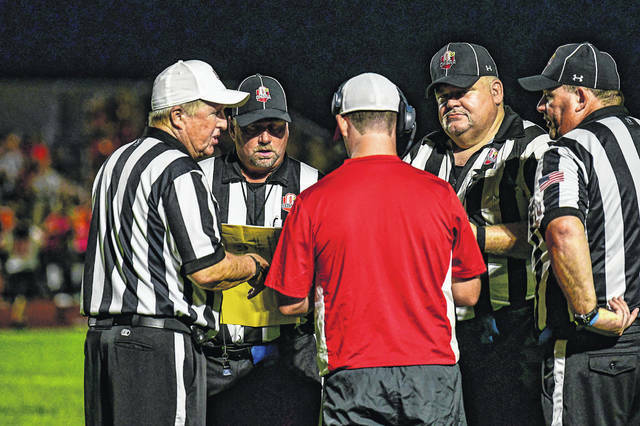 In the overtime, Trail got the ball first and failed to score, setting up Cottingim’s heroics. 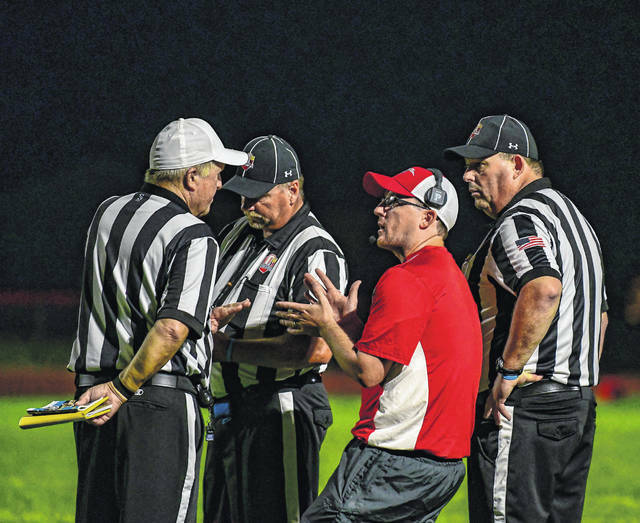 For Trail, coach Mark Hoffman was left wondering what might have been had his team not committed so many penalties. 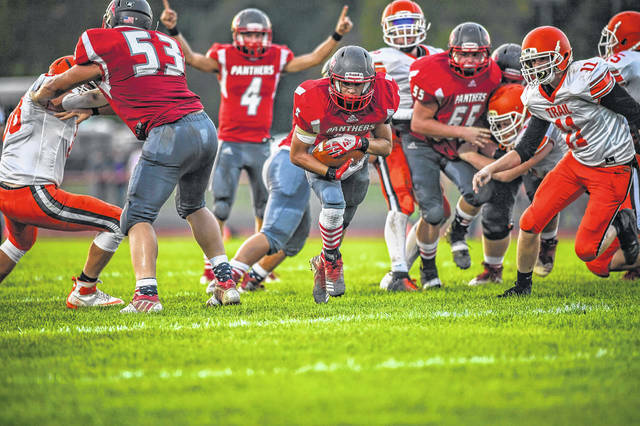 South (2-2, 1-1 CCC) is scheduled to travel to Mississinawa Valley on Friday. 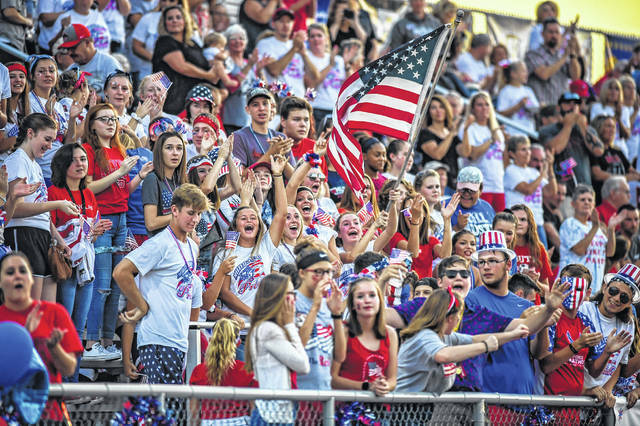 Trail (2-2, 0-2 ) will visit Tri-Village. 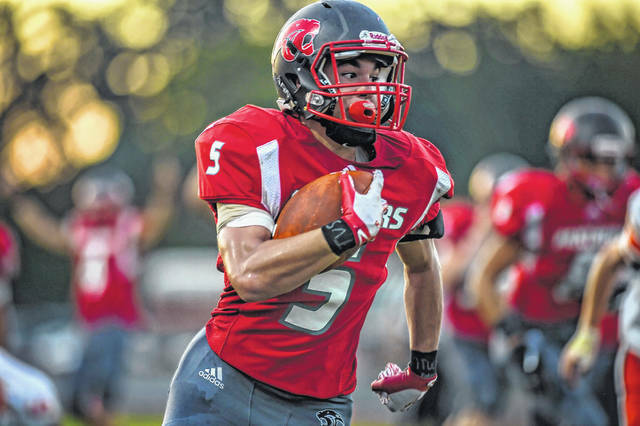 https://www.registerherald.com/wp-content/uploads/sites/41/2018/09/web1_nt_tvsfb8.jpgTwin Valley South’s Cade Cottingim races toward the end zone, in overtime, for the game-winning touchdown against visiting National Trail on Friday, Sept. 14. South won 26-20.